This weekend there are two fundraiser events for two amazing friends of mine who’ve each had their more than fair share of hard times the past few months. The first event is Friday evening for Amy Woloszyn, who was nearly killed by a drunk driver while riding home on her bicycle in San Francisco. She sustained a lot of injuries and has no health insurance which means insane medical bills. To make matters worse, this is the second time this has happened to her on San Francisco’s streets. She’s a safe rider, an amazing artist, a passionate beautiful human being and doesn’t deserve the ugliness that the mean streets have foisted on her. She has a blog chronicling her ordeal which she is able to update regularly. Amy’s event is at Balazo Gallery, Friday the 30th starting at 6pm. Todd Blair is a friend whom I met in 1999 while working on an SRL show in Tokyo. He’s one of the nicest and most giving human beings in the world and it is utterly heartbreaking the trauma he’s going through. He sustained massive head injuries while loading out the most recent SRL show in Amsterdam (I wasn’t there for that one). He is still in an Amsterdam hospital two months later slowly recovering as he battle complications. His love Alex is there by his side and constantly updating his blog with the daily ups and downs he’s had two endure since the accident. 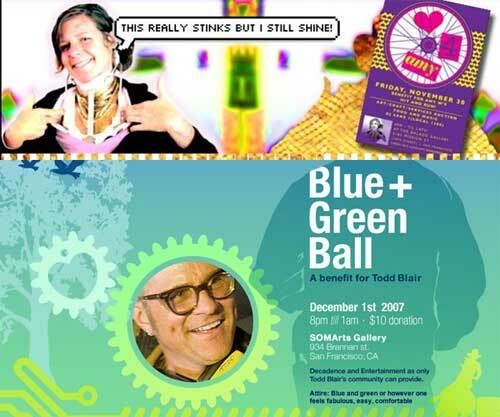 Todd’s fundraiser will be an amazing show of love and support from friends and artists at Somarts Gallery on Saturday, November 1st beginning at 8pm. I’m really bummed that I’ll be out of town and not be able to make either of these.